Over the past decade Paal Nilssen-Love has become the percussionist of choice for a range of free jazz and improvising musicians from his home country of Norway to the rest of northern Europe and beyond. Many of those roles call on the sheer force of his drumming, but Nilssen-Love has far more to offer than that. He’s a resourceful percussionist, able at will to call on the jazz traditions as well as adroitly exploring texture and sound. Double Tandem is Nilssen-Love joined by the two saxophonist/clarinetists Ken Vandermark and AbBaars, whose styles might seem initially incompatible. The heated blowing one immediately associates with Vandermark and Nilssen-Love is only one dimension of Cement though and the distinctive qualities that link the three musicians lie elsewhere. Baars and Vandermark share affinities as traditional tenor players and beyond that there’s their empathy as clarinetists, connoisseurs of the instrument’s quirky woodiness. Much of what characterizes Cement is a subtle exploratory quality and Nilssen-Love’s ability to fit in, reducing his work to the clearest rhythmic impetus, often armed with brushes rather than sticks. Peter Brötzmann’s name may not be in front of Hairy Bones, but there’s no question who is the leader. Snakelust is an enduring testimony to the galvanizing power of his work. The band is a direct outgrowth of the earlier Die Like a Dog quartet, retaining Toshinori Kondo on trumpet and electronics but with the amplified and machine-like team of Nilssen-Love and electric bassist Massimo Pupillo replacing Hamid Drake and William Parker. 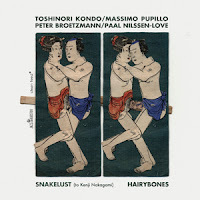 Kondo is an ideal foil for Brötzmann, his trumpet lines often minimal blasts and sputters that swirl off into space whereas Brötzmann is as expressive as any tenor saxophonist has ever been. The intensity never flags but it does shift direction frequently, including sustained three-way inventions between Pupillo’s pulsing bass, Kondo’s soaring electronics and Nilssen-Love’s shifting rhythmic patterns, all three reaching toward clarity in the midst of the very sonic maelstrom that they create.